Pamela Colleen Babb - Edmonton's Burial & Cremation Professionals | Trinity Funeral Home Ltd.
Pam passed away at home in her sleep in the early morning of Wednesday, Oct 31, 2018 at the age of 44. 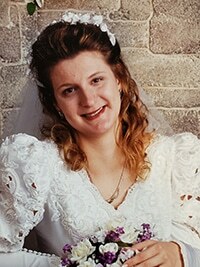 Pam was born on June 14, 1974 in Edmonton to Don and Sophie Zilinski. She is survived by her father Don, sister Donna Rapati, husband Aaron Babb, and daughter Emma Babb. In lieu of flowers donations may be made to the Heart & Stroke Foundation or Canadian Cancer Society. Pam will Live Forever in our Hearts. My deepest condolences on Pam’s sudden passing. My thoughts and prayers are with you all. Our sincerest condolences to Aaron, Emma, Donna and Don. We were neighbors on 35 St and always enjoyed Pam. It will be a wonderful time when there is no more death ( Revelation 21:4. ). Warm love and hugs. Aaron and Emma, please accept our heartfelt condolences. We were shocked and saddened to hear of Pam’s passing. Pam was extremely helpful and cheerful around the office, and our “go-to” person whenever we needed some information on what to do and who is doing what. She also added a lot of human kindness to the atmosphere of the office, ensuring that people who were hurting or in need got a card (sometimes hand-made) or something appropriate. Emma, you should be very proud of your mother. She will be sorely missed. Please accept our heartfelt condolences. I know that this is a journey that you must take on your own. Your friends and family will be there to help if you need them. If there is anything that I can do to make it easier you have only to ask. You will always miss your sister but remember the good times and memories that you have shared. Both Morag and I share your grief and send our love and support. With love Helen Parks and Morag Gordon. We were so so saddened to hear of Pam’s passing. Our thought and prayers are with you and your family at this time of GREAT sorrow. There are simply no words to express our sympathies for the loss of Pamela. I will forever remember fondly our coffee date that lasted the better part of an afternoon. All the laughs … And all the tears. Rest easy Pam. We want to offer our deepest condolences to all of the immediate and extended Babb family, especially Aaron and Emma. We were truly shocked and deeply saddened by the news of Pam’s passing this past week. Working with Pam on a daily basis for over the past 10 years, I got to know and admire her quick wit, laughter, kindness, and general caring nature for everyone she came in contact with. She left a memorable mark on our lives and a huge void that will never be filled. She will be deeply missed and will never be forgotten, living on in our memories forever.